The timing of activities within the academic year is vital. Busy or quiet periods in the university calendar do not necessary coincide with those in schools. 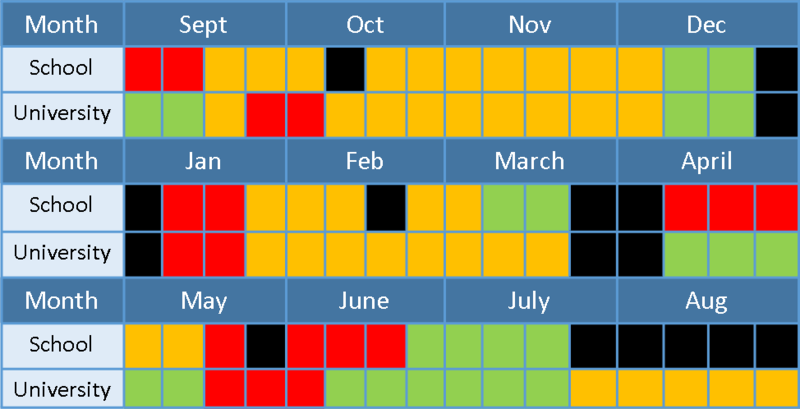 Holiday periods are also different (for details see Glossary). If you are already working within a partnership it will be much easier to agree a date that suits both parties. The planning tool (see below) may be helpful in identifying possible mutually convenient sections of the calendar. If a target school has been identified check availability with them before planning for a particular date. If you want to work with more than one school it may be necessary to set a date and then publicise this to the schools you want to work with. With either approach it is worth considering the following. Schools will generally need at least 6-10 weeks notice to complete the relevant paperwork, gain management and parental approval, collect permission slips and rearrange the timetable. Some schools agree their calendar a year in advance and teachers may find it difficult to get permission to take pupils out for an event that is not already in the calendar. However, they may have more flexibility in arranging for activities to be held at the school. See the Activities and Structure section for more information about the advantages and disadvantages of various types of activity and venue. Different times of year are more appropriate depending on the year group you are working with. The impact this has on how willing schools are to engage at particular times of year will vary from school to school. However, exam season (April – June) is generally a busy time for schools and it may be difficult to work with any year group during this time. For further details of key stages (KS) and age groups see the Glossary. Year 7 Settling in until Christmas. Year 9 Starting GCSEs in some schools. 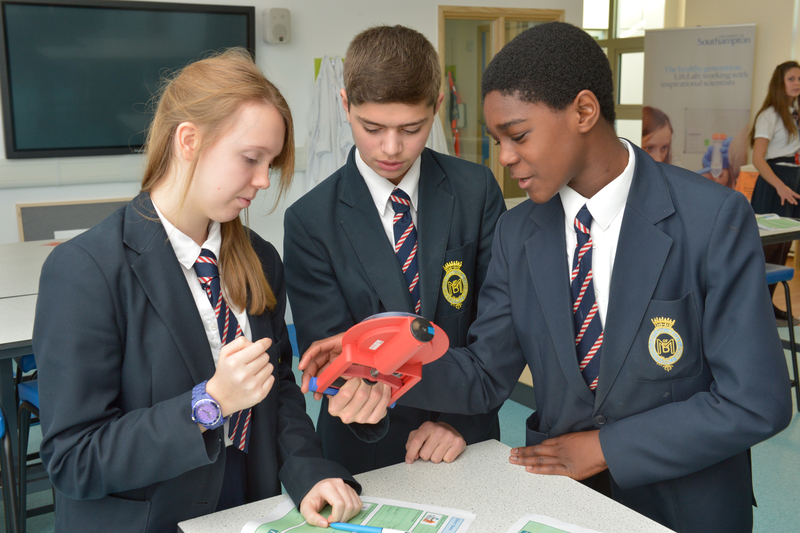 In others there may be a gap between KS3 and KS4 which schools may welcome help filling. Year 10 Studying for GCSEs. More time pressure from curriculum. Year 11 Studying for GCSEs. Exams in the spring/summer. Revision from Christmas onwards. Unfortunately many universities do not have specifically designated facilities for working with schools. Pressure on available laboratory space or other facilities will be a factor as will the varying workloads of the PhD students and other academics involved. If you are unable to be flexible on dates or have a specific time period in mind make this clear from the start. School students measure their grip strength during a day at LifeLab. The following tool, based on one designed by the University of East Anglia SUPI project, may be helpful in trying to identify mutually suitable blocks of time in the university or school timetable. Below is an example of some of the pressure points in school and university timetables based on the experience of the Talk to US! project. Appendix 3 includes a blank version of this table for you to fill out with your partner school or academic department to identify the low pressure points for your partnership. High pressure points are times when there can be little interaction between schools and universities, usually due to the lead-up and start to a new term, revision or assessment. Medium pressure points are times when there can be some interaction but this will depend on teaching loads and administrative pressures. These periods are possibly more suited to discussions around the practicalities and content of activities rather than the activities themselves. Low pressure points are good opportunities for interaction e.g. when teaching at the university slows or stops. These times are often the most appropriate for school students to visit the university due to greater availability of facilities. School/University Holidays can be good times strategic meetings depending on the availability of specific individuals. Understandably, however, some teachers/researchers will wish to protect this time and will therefore not be available.